Learning about quantitative analysis was a challenge this semester and in hindsight, I have to wonder if it has to do with the method of teaching as opposed to the content. I understand it better than I have before but got frustrated pretty regularly in working on the course throughout. Our instructor's approach was to pop open the hood, explain in detail all of the intricacies of the car so that we could learn how to drive. I think it would have been better to work on the driving and get a sense of the global dynamics of the car before delving us into the nuance pieces as it would have helped us better connect the pieces to the machine. But apparently, I learned enough to do well on the final project so I did learn some things. At this point, I'm now trying to determine what it is that I want to do for my dissertation (I'll have a blog post on my areas forthcoming, so this section will be a bit general). Given that, I'm also beginning to look at my electives and figure out what are the right ones to take based upon what it is I want to do. While the program has some electives that I feel will be useful, I think the biggest challenge is to find a course that provides a critical inspection of technology. I've started looking around to find the right course to fill this gap as it's something I feel no matter what specific question I'm asking in my dissertation, technology and learning will be at the center of the question. Challenging as this semester has been, it has also been a powerful reminder of the importance of the cohort. 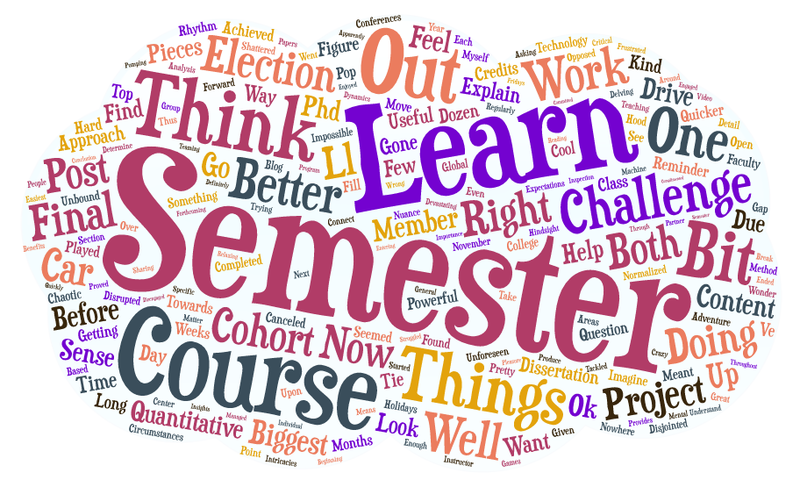 I definitely struggled with the quantitative course but managed to get through with the help of my cohort who often had great insights and means of explaining things to me or even sharing their work so I could see how they got to their conclusion and figure out where I went wrong. Also, I ended up teaming up with a cohort member for a final project that proved one of the easiest projects that I tackled yet in the sense that we complimented each other well and were able to produce something that we both enjoyed doing rather than just pumping out individual papers that we were both disengaged with. 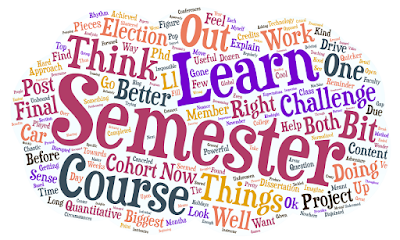 Thus, the semester has been a powerful reminder in the usefulness and benefits of doing group or partner projects when both people are committed and engaged with the content. Well, the semester's over and it's time for a mental break of reading for pleasure, video games, and relaxing. It's crazy to think that at this time next year, I'll be entering into to my final Fridays semester--but it's quickly approaching!